Aronia Berry is native to Eastern Canada and the Eastern United States. 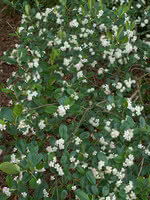 This branching shrub forms well rooted clumps that can spread. Flowers are usually white (or pink) and they produce black fruit that some people find too astringent, hence they are also known as Black Chokeberry. People who like the taste and not the astringent tannins often blend the berries or juice in with other things. Some find that Aronia is an attractive ornamental plant for the garden. These shrubs grow well under other trees and their fall color is a vibrant red. It is common to see it used as a hedge. The berries have their own unique flavour. The polyphenols and anthocyanins are touted as healthy antioxidants and lots of research seems to be underway on the health benefits of this fruit. We do not grow Aronia Berry every year.